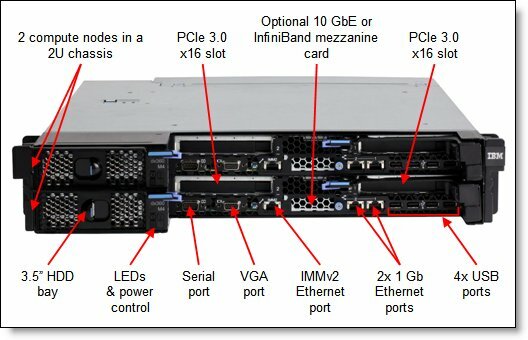 The System x® iDataPlex® dx360 M4 compute node is designed to optimize density and performance within typical data center infrastructure limits. The unique half-depth form factor is designed to help you improve compute density in your space-constrained data center while also improving system cooling and energy efficiency. With more computing power per watt and the latest Intel Xeon processors, you can reduce costs while maintaining speed and availability. Note: This server is withdrawn from marketing. 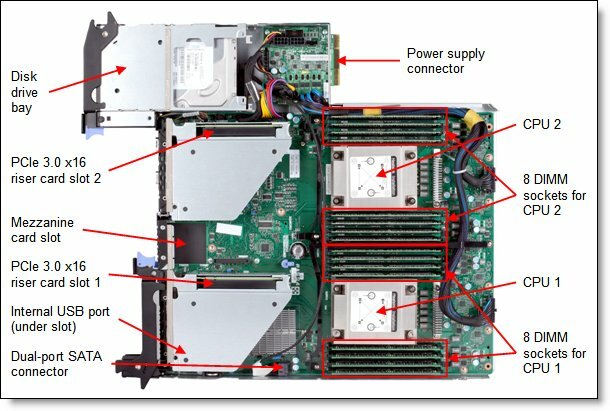 The System x® iDataPlex® dx360 M4 compute node is designed to optimize density and performance within typical data center infrastructure limits. The unique half-depth form factor is designed to help you improve compute density in your space-constrained data center while also improving system cooling and energy efficiency. With more computing power per watt and the latest Intel Xeon processors including the new Intel Xeon E5-2600 v2, you can reduce costs while maintaining speed and availability. Suggested use: Web 2.0, HPC clusters and large corporate data processing. With options from highly efficient low-voltage 60 W processors to high-performance 135 W processors, you can precisely balance your performance needs against energy usage. Up to two Graphics Processing Units (GPUs) or coprocessors can also be included as expansion options for those specialty workload needs. Networking choices include Ethernet up to 10 Gbps and InfiniBand connectivity. You can also choose from three storage configurations based on performance and capacity needs. A range of power supply selections round out flexible configuration options, so you can choose the right option to support your workloads within your data center power and cooling envelope and budget limits. The iDataPlex design is a data center solution for customers finding limitations in their scale-out computing environments. By delivering customized solutions that help reduce overall data center costs, Lenovo addresses the business growth challenges in the massive scale-out marketplace. The iDataPlex solution incorporates innovative ways to integrate x86-based processing performance at the node, rack, and data center levels. The iDataPlex solution provides customers with outstanding energy and cooling efficiency, multi-rack level manageability, complete flexibility in configuration, and minimal deployment effort. A typical iDataPlex solution consists of multiple fully populated rack installations. The groundbreaking iDataPlex solution offers increased density in a new rack design. It uses the dimensions of a standard 42U enterprise rack but can hold 100U of equipment, populated with up to 84 servers, plus sixteen 1U vertical slots for switches, appliances, and power distribution units (PDUs). This added density addresses the major problems that prevent most data centers today from reaching their full capacity: insufficient electrical power and excess heat. The energy-efficient design of the iDataPlex servers and chassis can significantly reduce the incoming energy requirement compared with standard 1U servers. In addition, the optional liquid-cooled Rear Door Heat eXchanger mounted to the back of the rack can remove 100% of the heat generated within the rack, drawing it from the data center before it exits the rack. It can even go beyond that, to the point of helping to cool the data center itself and reducing the need for Computer Room Air Conditioning (CRAC) units. This allows racks to be positioned much closer together, eliminating the need for hot aisles between rows of fully populated racks. With the iDataPlex chassis design, air needs to travel only 20 inches front to back, rather than the 30 plus inches of a typical enterprise server. This shallow depth is part of the reason that the cooling efficiency of iDataPlex servers is so high—shorter distance means better airflow. In addition, the new design uses four large 80 mm fans per 2U chassis for more efficiency and lower noise than the eight small 40 mm fans used in standard 1U servers. The increased air pressure resulting from the shorter distance through the rack and the larger fans makes for one of the most efficient air-cooled solutions on the market. Unlike most conventional racks, which are often left largely empty due to power and cooling limitations, the iDataPlex Rack can be fully populated, while removing all rack heat from the data center (up to 100,000 BTUs or 30 kW), using the Rear Door Heat eXchanger. In addition, iDataPlex chassis uses highly efficient (80 PLUS Platinum) power supplies, reducing energy draw and waste heat further. The Intel Xeon processor E5-2600 v2 product family improves productivity by offering superior system performance with 12-core processors and up to 3.5 GHz core speeds, up to 25 MB of L3 cache, and QPI interconnect links of up to 8 GTps. Two processors, up to 24 cores, and 48 threads maximize the concurrent execution of multi-threaded applications. Intelligent and adaptive system performance with Intel Turbo Boost Technology 2.0 allows CPU cores to run at maximum speeds during peak workloads by temporarily going beyond processor TDP. Intel Advanced Vector Extensions (AVT) significantly improve floating point performance for compute-intensive technical and scientific applications compared to previous generation processors. Support for high-performance Intel coprocessors and NVIDIA GPGPU adapters which offer significant additional single-precision floating point performance per server. 16 DIMMs of registered 1866 MHz or 1600 MHz DDR3 ECC memory provide speed, high availability, and a memory capacity of up to 512 GB. The use of solid-state drives (SSDs) instead of or along with traditional spinning drives (HDDs) can significantly improve I/O performance. An SSD can support up to 100 times more I/O operations per second (IOPS) than a typical HDD. PCI Express 3.0 I/O expansion capabilities that improve the theoretical maximum bandwidth by 60% (8 GT/s per link) compared with the previous generation of PCI Express 2.0. Support for 10 Gb Ethernet and FDR mezzanine cards that offer network performance without consuming a PCIe slot. Four USB 2.0 front-mounted ports for connectivity to external flash drives, optical drives, tape drives, and other USB devices. Systems Director is included for proactive systems management. It offers comprehensive systems management tools that help to increase up-time, reduce costs, and improve productivity through advanced server management capabilities. Intel Trusted Execution Technology provides enhanced security through hardware-based resistance to malicious software attacks, allowing the application to run in its own isolated space protected from all other software running on a system. A shallow chassis design that minimizes the air flow from the front to the back of the server, thereby maximizing cooling effectiveness. Optional Rear Door Heat eXchanger that uses liquid cooling to remove from the data center, all heat generated by the servers. Large 80 mm fans to maximize air flow efficiencies. Choice of three power supplies to match the processor and GPGPU configuration of your servers and maximize energy efficiency. The Intel Xeon processor E5-2600 v2 product family offers significantly better performance over the previous generation while fitting into the same thermal design power (TDP) limits. Low-voltage 1.35 V DDR3 memory RDIMMs consume 15% less energy than 1.5 V DDR3 RDIMMs. The server uses hexagonal ventilation holes in the front and rear of the casing, which can be grouped more densely than round holes, providing more efficient airflow through the system. Systems Director Active Energy Manager™ provides advanced power management features with actual real-time energy monitoring, reporting, and capping features. The 2U chassis supports redundant power supply options, which means greater system uptime. All components can be removed from the front of the rack by sliding out the trays or the chassis for easy, quick servicing. Tool-less cover removal provides easy access to upgrades and serviceable parts, such as HDDs and memory. The dx360 M4 offers memory mirroring and memory rank sparing for redundancy in the event of a non-correctable memory failure. Optional RAID arrays enable the server to keep operating in the event of a failure to any one drive. Solid-state drivers (SSDs) offer significantly better reliability than traditional mechanical HDDs for greater uptime. Predictive Failure Analysis (PFA) detects when system components (processors, memory, and hard disk drives) operate outside of standard thresholds and generates pro-active alerts in advance of possible failure, therefore increasing uptime. Built-in Integrated Management Module II (IMM2) continuously monitors system parameters, triggers alerts, and performs recovering actions in case of failures to minimize downtime. The IMM2 offers optional remote management capability to enable remote keyboard, video, mouse (KVM) control of the server. 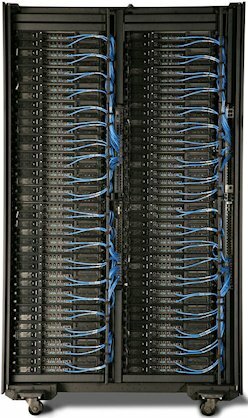 Figure 2 shows the two dx360 M4 servers installed in the iDataPlex dx360 M4 2U chassis. 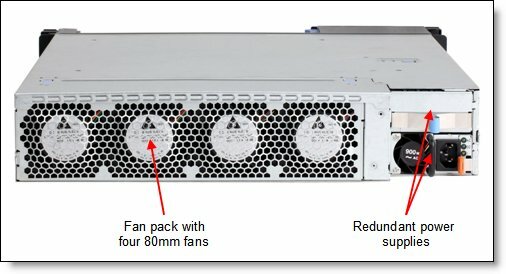 Figure 3 shows the rear of the 2U chassis showing the shared fan pack and power supplies. Form factor Half-depth, 2U chassis with up to two planar trays. Supported chassis System x iDataPlex dx360 M4 2U chassis, type 7913. Processor Two Intel Xeon Processor E5-2600 or E5-2600 v2 series processors; QuickPath Interconnect (QPI) links speed up to 8.0 GTps. Hyper-Threading Technology and Turbo Boost Technology. Intel C602J (Patsburg-J) chipset. Up to 12 cores per processor. Core speeds up to 3.5 GHz. Integrated L3 cache up to 25 MB. Memory cache Up to 20 MB. Memory Up to 16 DIMM sockets (8 DIMMs per processor) supporting DDR3 DIMMs. Four memory channels per processor (two DIMMs per channel). For E5-2600-based systems: RDIMMs with memory speeds of 1600 MHz or 1333 MHz, or UDIMMS at 1333 MHz are supported. For E5-2600 v2-based systems: RDIMMs with memory speeds of 1866 MHz or 1600 MHz, or UDIMMS at 1600 MHz are supported. Memory maximums For E5-2600-based systems: Up to 512 GB with 16x 32 GB LRDIMMs and two processors. For E5-2600 v2-based systems: Up to 256 GB with 16x 16 GB LRDIMMs and two processors. Memory protection ECC, memory mirroring, and memory sparing. Disk drive bays One 3.5" simple-swap SATA or two 2.5" simple swap SAS/SATA HDDs or SSDs, or four 1.8" simple-swap SSDs. Maximum internal storage Up to 12 TB per 2U chassis using two 6 TB 3.5-inch drives. RAID support Two-port 6 Gbps PCIe 3.0 SATA controller with Intel C600 chipset. Optional RAID with supported 6Gbps RAID controllers. Optical drive bays No internal bays; use an external USB drive. See http://support.lenovo.com/en/documents/pd011281 for options. Tape drive bays No internal bays. Use an external USB drive. Network interfaces Two Gigabit Ethernet ports using onboard Intel I350 Gb Ethernet controller. Optionally, two FDR InfiniBand ports or two 10 GbE ports via a mezzanine card (which does not occupy a PCIe slot). Use of both riser slots requires two CPUs to be installed. For CTO configurations, alternative risers can be used with PCIe chassis trays to provide GPU support. Ports One RS232 serial port, one VGA port, one 1 Gbps RJ45 connector for dedicated systems management (wired to the IMM), a slot for the mezzanine card ports (SFP+ or 10BaseT RJ45 depending on the card), two 1 Gbps Ethernet ports, five USB 2.0 ports - four on the front of the server, one internal. Cooling Supplied by the 2U chassis using four 80mm fans in the standard fan pack. Power supply Supplied by the 2U chassis; 1 standard, 2 maximum; Options are 550 W, 750 W, or 900 W, all with 80 PLUS Platinum certification. When two are installed, they form a redundant pair. iDataPlex rack offers Direct Dock power cord connections for easy installation and removal. Chassis 7913-A2x includes one 900W High Efficiency Platinum AC Power Supply (second supply optional). Systems management UEFI, Integrated Management Module II (IMM2) with Renesas SH7757 controller, Predictive Failure Analysis, Light Path Diagnostics, Automatic Server Restart, Systems Director and Active Energy Manager, ServerGuide. Video Matrox G200eR2 video core with 16 MB DDR3 video memory integrated into the IMM2. Maximum resolution is 1600x1200 with 16M colors (32 bpp) at 75 Hz, or 1680x1050 with 16M colors at 60 Hz. Security features Power-on password, administrator's password, Trusted Platform Module 1.2. Operating systems supported Red Hat Enterprise Linux, SUSE Linux Enterprise Server, Microsoft Windows Server 2008 R2 and 2008, VMware vSphere Hypervisor. Limited warranty 3-year customer-replaceable unit and onsite limited warranty with 9x5/NBD. Service and support Optional service upgrades are available through ServicePacs: 4-hour or 2-hour response time, 8-hour fix time, 1-year or 2-year warranty extension, remote technical support for Lenovo hardware and some Lenovo and OEM software. † Processor detail: Processor quantity and model, cores, core speed, L3 cache, memory speed, power consumption. * Models 42x and 62x include a Mellanox ConnectX-3 Dual Port QDR/FDR10 Mezzanine Card, 90Y6338, which installs in the dedicated mezzanine slot. The dx360 M4 is supported in the System x iDataPlex dx360 M4 2U chassis, type 7913. The standard chassis model is listed in the following table. Figure 2 shows this chassis configuration. Figure 5 shows the configuration with the PCIe tray. Each iDataPlex chassis provides a shared high-efficiency power supply and fans. The iDataPlex uses Direct Dock Power to power the nodes in the chassis. Industry standard power cords power each node, but the cords are attached to the rack in a fixed location. When you slide in the chassis, the power receptacle of the chassis simply connects to the power cord, which means that you do not have to access the rear of the rack to attach the power cord. The dx360 M4 supports the processor options listed in the following table. The dx360 M4 supports DDR3 memory. The server supports up to eight DIMMs when one processor is installed and up to 16 DIMMs when two processors are installed. Each processor has four memory channels, and there are two DIMMs per memory channel (2 DPC). Up to 16 LRDIMMs, RDIMMs or UDIMMs are supported (8 per processor). The server supports both 1.5 V and 1.35 V DIMMs. Mixing 1.5 V and 1.35 V DIMMs in the same server is supported. In such a case all DIMMs operate at 1.5 V.
If memory mirroring is used, then DIMMs must be installed in pairs (minimum of one pair per each CPU), and both DIMMs in a pair must be identical in type and size. If memory sparing is used, then DIMMs must be installed in sets of three, and all DIMMs in the same set must be identical in type and size. The following two tables lists memory options available for the dx360 M4 server. The first table is memory options for systems with E5-2600 processors. The second table is memory options for systems with E5-2600 v2 processors. The following table shows the maximum memory speeds that are achievable for systems with E5-2600 processors based on the installed DIMMs and the number of DIMMs per channel. In the table, cells highlighted with a grey background indicate when the specific combination of DIMM voltage and number of DIMMs per channel still allows the DIMMs to operate at rated speed. The following table shows the maximum memory speeds that are achievable for systems with E5-2600 v2 processors based on the installed DIMMs and the number of DIMMs per channel. In the table, cells highlighted with a grey background indicate when the specific combination of DIMM voltage and number of DIMMs per channel still allows the DIMMs to operate at rated speed. As described in "Chassis configurations," the iDataPlex dx360 M4 server supports 3.5" simple-swap SATA drives, 2.5" simple-swap SAS/SATA HDDs or SSDs, or 1.8" simple-swap SSDs. The number of drives supported depends on the configuration as listed in the following table. The table also lists the adapters supported for each drive configuration. Table 9. Drive type and RAID adapter support. The following table lists the RAID controllers and additional options used for internal disk storage of the dx360 M4 server. Four internal 6 Gbps SAS/SATA ports. One x4 mini-SAS internal connector (SFF-8087). 6 Gbps throughput per port. Based on LSI SAS2004 6 Gbps RAID on Chip (ROC) controller. x4 PCI Express 2.0 host interface. Supports RAID 0, 1, 1E, and 10. SAS and SATA drives are supported, but the mixing of SAS and SATA in the same integrated volume is not supported. Supports up to two integrated volumes. Supports up to two global hot-spare drives. Supports drive sizes greater than 2 TB for RAID 0, 1E, and 10 (not RAID 1). Fixed stripe size of 64 KB. The following table lists hard drive options for internal disk storage of dx360 M4 server. The dx360 M4 supports GPU adapters and coprocessors when the PCIe tray is attached, as described in "Chassis configurations." The following table lists the supported adapters. The operating systems supported by each GPU and coprocessor adapter is listed in the Supported operating systems section. 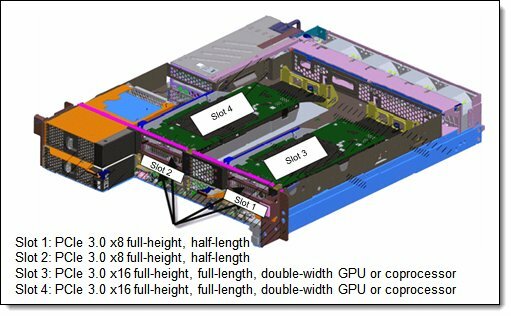 The iDataPlex dx360 M4 server also supports an additional mezzanine card with a dedicated PCIe x8 slot at the front of the chassis, as shown in Figure 2. The supported adapters are listed in the following table. * Not supported in systems with Intel Xeon E5-2600 v2 processors. The following table lists storage HBAs supported by the dx360 M4 server. The server supports the High IOPS SSD adapters listed in the following table. The System x iDataPlex dx360 M4 2U chassis, type 7913, supports up to two redundant hot-plug power supplies, providing N+N redundancy. These High Efficiency (HE) Platinum AC power supplies are 80 PLUS Platinum certified to allow for the best efficiency values of your data center. Power supplies support 100 - 240 V. The following table lists the power supplies. The blue-screen capture feature captures the video display contents before the IMM2 restarts the server when the IMM2 detects an operating-system hang condition. A system administrator can use the blue-screen capture to assist in determining the cause of the hang condition. The following table lists the remote management option. The System x iDataPlex dx360 M4 has a 3-year onsite warranty with 9x5/next business day terms. Lenovo offers the warranty service upgrades through ServicePacs, discussed in this section. The ServicePac is a series of prepackaged warranty maintenance upgrades and post-warranty maintenance agreements with a well-defined scope of services, including service hours, response time, term of service, and service agreement terms and conditions. The dx360 M4 and the iDataPlex dx360 M4 2U chassis are designed to be installed in the System x iDataPlex Rack, machine type 7825. This 100U rack (50U in each half) was specifically designed with a reduced depth to meet high-density data center requirements. It allows infrastructure components, such as switches and power distribution units, to be installed into the rack in vertical pockets without sacrificing valuable server space. The following figure shows the iDataPlex Rack. 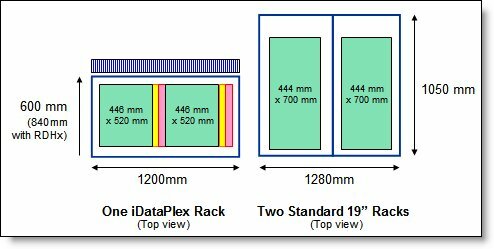 The following figure compares the footprint of the iDataPlex rack with enterprise racks. The iDataPlex dx360 M4 2U chassis can be installed in the iDataPlex rack or a standard enterprise rack. Rail kits are listed in the following table. Direct Dock Power is an innovative way to connect power cords to servers. The power cords are industry standard cables, but each is attached to the rack in a fixed location. When you slide in the chassis, the power receptacle of the chassis simply connects to the power cord, which means that you do not have to access the rear of the rack to attach the power cord. The following figure shows the Direct Dock Power mounting. With the standard rack rail kit, 90Y6335, the rack is supported in the enterprise racks listed in the following table. Lenovo offers an alternative to standard air cooling systems with the Rear Door Heat eXchanger (part number 43V6048). The Rear Door Heat eXchanger replaces the existing rear door of an iDataPlex rack and provides an extremely efficient water-based cooling solution. The exchanger dissipates heat generated by all servers and provides the data center with cooling at the most efficient place, which is immediately behind the exhaust of the system fans. The heat exchanger adds 127 mm (5 in.) to iDataPlex Rack depth if the casters are removed. Depending on conditions, the Rear Door Heat eXchanger can extract all heat produced by equipment using 30 kWh of energy (while operating at 90 - 94% of the door’s maximum efficiency). The Rear Door Heat eXchanger does not use electricity. The server supports attachment to external storage expansion enclosures by using the ServeRAID M5120 SAS/SATA Controller. The server can also be attached to supported external storage systems by using a supported HBA (see the earlier "Storage HBA" section). The following table shows the RAID controllers and options for external disk storage expansion. * These M5120 features upgrades require a cache memory upgrade (81Y4487 or 81Y4559). The controllers support connectivity to the external expansion enclosures that are listed in the following table. Up to nine expansion enclosures can be daisy-chained per one controller external port. For better performance, distribute expansion enclosures evenly across both controller ports. Intel®, Xeon Phi™, and Xeon® are trademarks or registered trademarks of Intel Corporation or its subsidiaries in the United States and other countries.